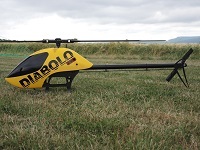 Enthusiats of super light helicopters find in the Diabolo 700 Ultra Light (kurz: 700UL) an allround model suitable for daily use what offers already with a small motor excellent flight items. 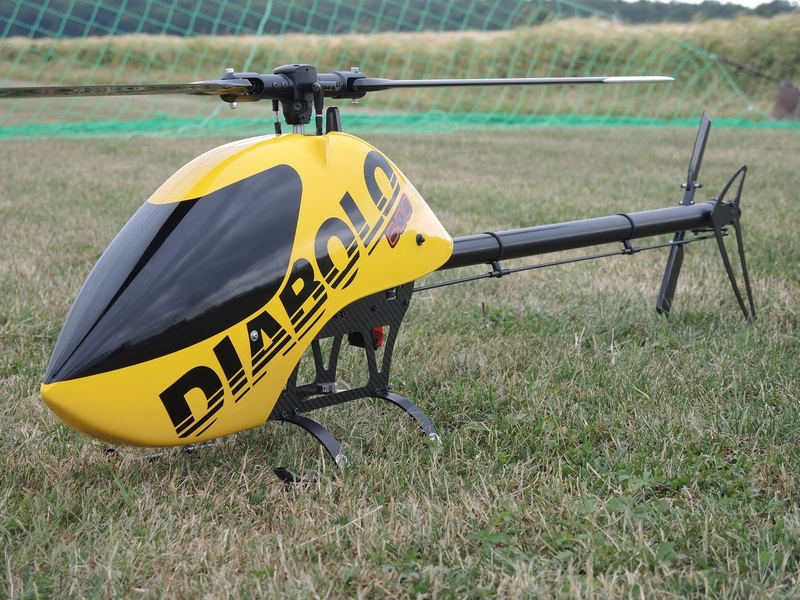 Based on the very robust and especially for its easy maintenance liked frame of the Diabolo 600 the Diabolo 700 UL is equipped with a longer tailboom, the mainrotor head from its big brother, the Diabolo 700. 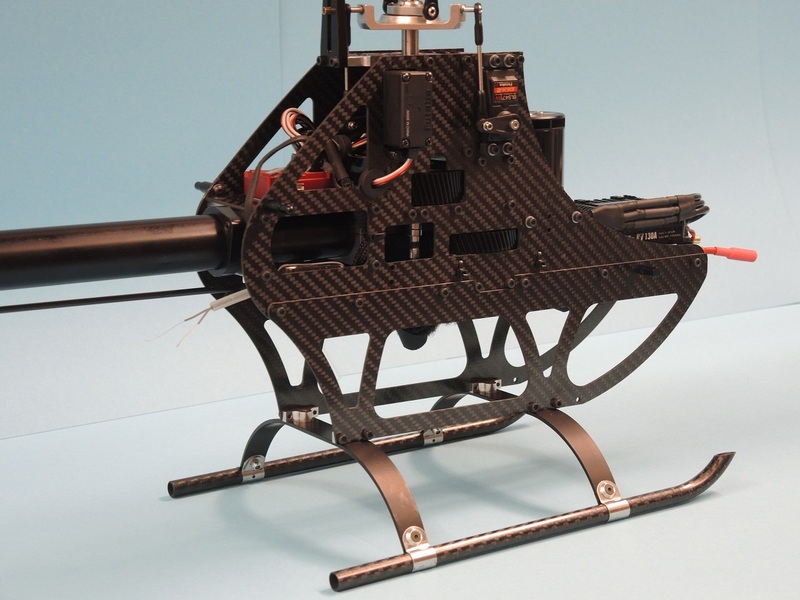 So especially the lovers of long autorotations will enjoy this model. The special advantages of the Diaboolo 700 are in the Low-RPM area, so the flying with low headspeeds. 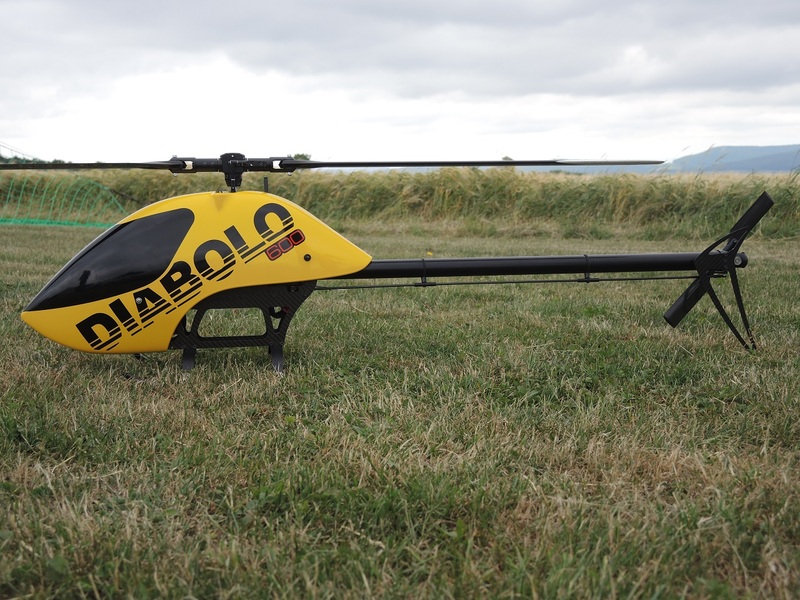 The outer appearance is simlar to the Diabolo 700, because it can either equipped with the canopy designed from Nick maxwell for 3D contest flight or with the classic Diabolo 700 canopy. 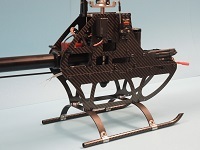 The battery compartment in the frame was designed in that way that also combi motors (for alternativ use with 6/7s and 12s) can be used without modifications or additional parts. The cast frame is, as on all Diabolos, a guarantee for a maximum of stability and is so responsible for very few repair and maintenance costs in daily use. 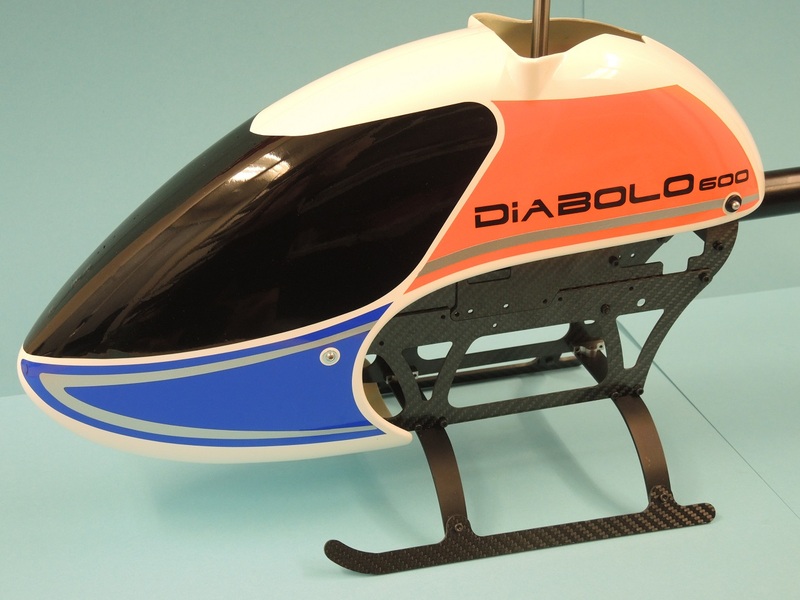 As on the Diabolo 700 too the frame is double parted here, but is additionally equipped with a maintenance hole to make a change of a tailbelt or a gear wheel very easy. The change of a tailbelt is so f.e. a job for about 10-15 minutes. The new designed rubber damped belt tensioner is now in the inner of the frame but it is easily to reach thru a maintenance hole oin the right side of the frame. 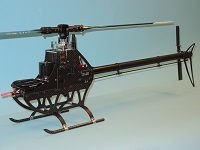 All shaft diameters are taken from the Diabolo, the manishaft has 10mm diameter, the spindle is 8mm and the tailrotor shaft is 6mm thick, all hardened to get in rough 3D use a maximum of reserves. Also the special for the Diabolo made swash plate bearing with extra low play could be used. To reach an easy and comfortable mounting of electric components and cables many slots and fixing holes for cable tyes were integrated. 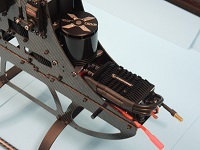 Receiver, ESC, FBL etc find enough space on the big dimensioned rear mounting plate between the frames. 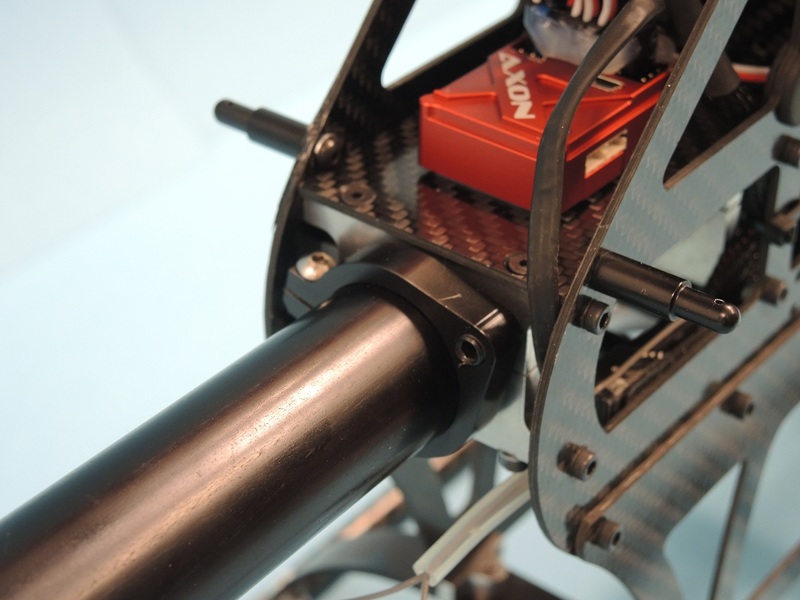 Additionally the inner frame above the maingear wheel can be used for additional components like battery caps. The flight battery can be equipped with an alternative avilable battery tray system or will be fixed with light and easy to mount O-rings. The model can be equipped thru the long battery compartment universally with 6/7s or 12s batteries. 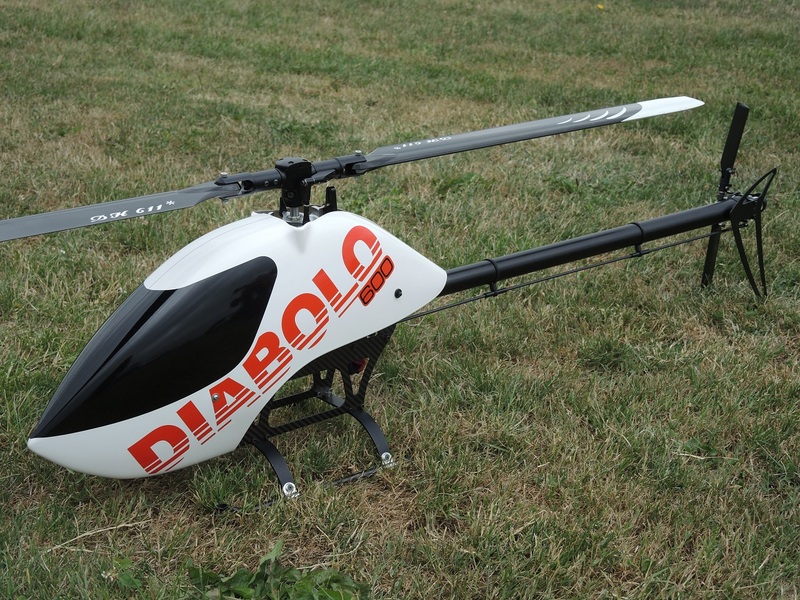 The tailrotor is identical to the Diabolo now with new design and a little bit less weight. The mainrotor is also the thousands of times sold mainrotor of the Diabolo. A O-ring damped spindle, eight times ball raced swash driver, blade tracking with righ/left threaded rods and its robustness, reliability and precision are the special features of this head. 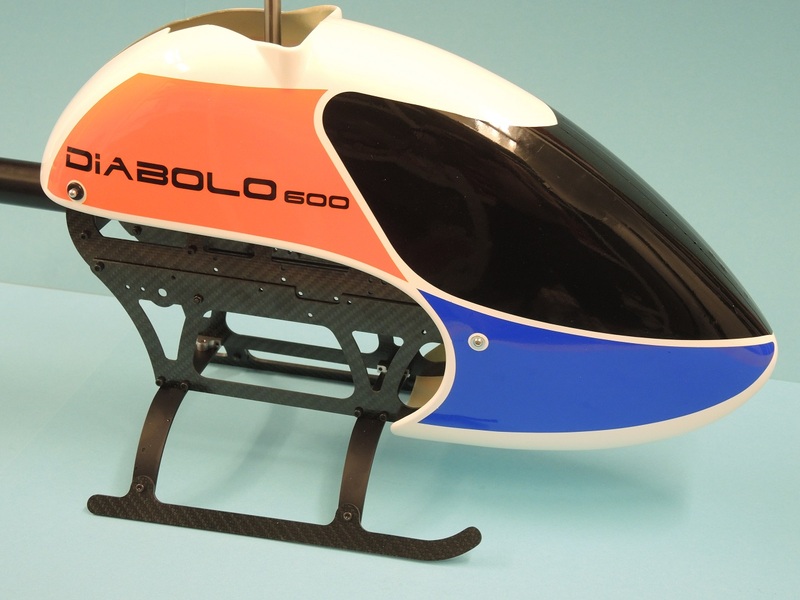 The canopy is alternatively the Nick Maxwell styled 3D contest canopy or the classical Diabolo canopy. Standard size servos can be used. 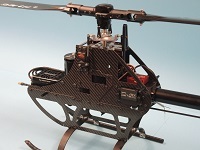 The frame has an inner width of 56.5mm. So motors upto 4525 size can be used. We must mention that during flight tests never the need of a bigger motor as 4030 was found. So this option will be in pratise more of theoretical nature. 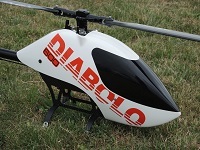 The best motor for the Diabolo 700UL has a 40 mm stator diameter and a stator length of 25-35mm. 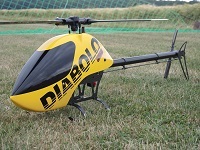 In the Diabolo 700 UL as preferrenced batteries 6s/7s/5000 and 12s/4000 with fitting electric components should be used. 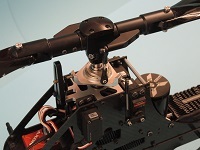 As 7s drive is then recommended if already a HV controller and fitting battereis are in stock.